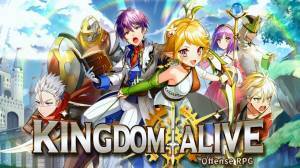 Kingdom Alive a 2-dimensional RPG where the objective is to put together a team from nine available classes of heroes that is capable of defeating whatever enemy is thrown their way. Each of the heroes you can choose to make up your team comes with their own unique abilities, strengths and weakness and you have to determine The Best Team setup for each battle. The game is presented in the combat postcard format and in every stage you have 3 minutes to destroy the enemy’s tower to win the battle. To give your heroes the best chance of victory you will need to ensure they have the proper upgrades and equipment to deal with the enemy. As your team progresses through the game defeating the enemy the overall difficulty of the foe they will encounter will increase. To continue being successful you will need to devise a strategy that takes advantage of the correlation between the classes of heroes. 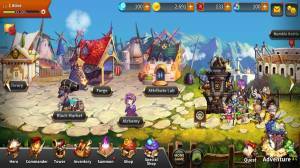 The game has multiple modes, these include Adventure, Rumble Battle and 7 Days of Sanctury. The actual story itself focuses on the 3rd Expedition Team from the Victor Kingdom and their quest to conquer the New World Pandora. 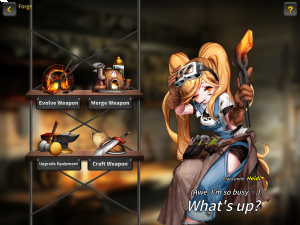 The game portrays the story through webtoon. During battles you will often see symbols appear above your units in the bottom left corner. Pay attention to these symbols as these are the units the game recommends you to deploy. If the class symbol is in a red bubble it indicates that the unit advised has the advantage over the enemy units that are currently on the field. If the class icon is in a green bubble it means that that unit can support that class on the field. Make sure you learn what the correlation is between the different classes and take advantage of this knowledge to deal bonus damage on the battlefield. You can check the enemy class before you start the battle and during the battle by looking at the top of the screen under the HP bar. Whenever you see a red meter next to your team line-up that says 'Weak' it indicates that one of your units has the class advantage over the enemy unit and the red meter will replenish slightly. When this meter is fully charged all of your unit selection will begin to glow with a red aura and the next unit you deploy will be a charged one that will be able to deal more damage. The best strategy to take advantage of this so you get the most benefit is to use it on one of your expensive units. You can reposition your tower at any time, normally when doings so your first priority is ensuring that wherever it is you decide to place it you have it protected from the enemy. However if are struggling to progress you may want to consider taking advantage of your tower and bringing it up to the fight where it's bombardment shots can inflict some heavy damage on the enemy. Check out our Best Tower page to learn more about towers. It is advised that when you start playing a new level you begin by playing manually and don't use auto mode. The reason for this is when you use auto mode in a game where you are evenly matched the CPU tends to deplay one or two too many or few units and it does so randomely with no concern for the class advantage system. It is recommended that you try and complete as many of the daily and weekly missions as possible as this is the best way to get the 1,000 gems that are needed to perform the Summon Gem Hero option which will enable you to get new heroes. To power up your heroes so they able to deal with elite monsters it is recommended that you farm for resources by repeating stages. These resources include EXP tickets to level up, fragments to craft equipment, and gold coins to summon heroes and equipment. Keep in mind that you can play an area in three modes; Normal, Hard, and Hell. As there is a a time limit it is advised that you clear an area in Normal mode first before switching to Hard mode. If you swipe towards the left hand side of the main menu you will be taken to the Forge, here your heroes will be able to significantly improve their stats by being properly equipped with the right helmets, armour, or swords. Having the correct equipment will give your heroes an advantage in battle which could be the difference between victory and defeat. The Forge also allows you to merge items such as pendants, amulets, rings, or magic robes to improve the equipment in your inventory. You will be rewarded Attribute Points as you level up. Make sure you spend them in the Attribute Lab to activate buffs that will help your units in battle. Pay attention to the timer in the upper portion of the screen and manage the alloted 3 minutes for the battle wisely once you have deployed your heroes. Your team will automatically move forward and engage the enemy and you will be able to control the tempo of the battle with the commands in the top left corner of the screen. The two options available to you are 'Auto' play and 'Continuous Battle'. It is advised that if you are running out of time and the enemy you are facing is still strong you deploy all the forces you can muster in a last ditch effort to win the battle. Make sure before you select heroes for an assault you check the preview on the right hand side of the screen to see the attributes of the enemies which you will encounter on the battleground. Studying the enemy will give you a chance to choose the best suited heroes for the battle ahead and also equip them with the necessary equipment. Check out our The Best Team page to learn how to put together a good team. When equipping your heroes with equipment you may want to consider using the AutoMount feature as this option will make the process quicker and save you time. Make sure you check out the black market daily so you are able to get desired items for less gold coins than you would normally pay. These items include; EXP tickets, crafting material, mana essence, opal, and garnet.